The City of Lake Forest Park is amending its development code to smooth the way for the Town Center VISION created earlier in 2018. An Open House on Wednesday, October 10, 2018 from 6-8pm in the LFP City Hall Council Chambers, 17425 Ballinger Way NE, will give citizens an opportunity to give feedback. ...to be analyzed in the environmental impact statement (EIS). The EIS will look at potential changes to the City’s Planning and Land Use Regulations and related redevelopment scenarios. 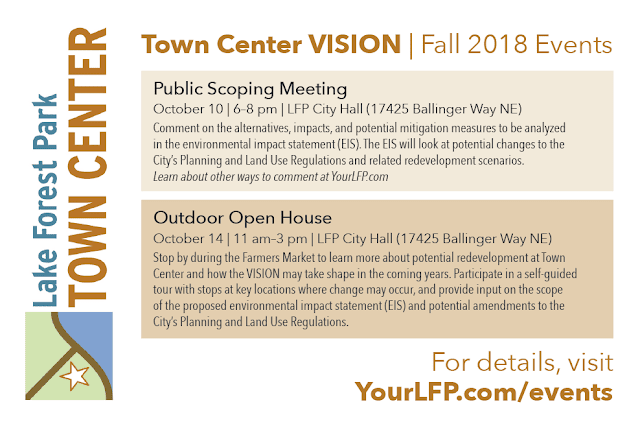 If you can't be there, learn about other ways to comment or stop by the October 14 Outdoor Open House between 11:00am and 3:00pm (during the Farmers Market) where you will also be able to submit comments.